Information for volunteer staff applicants. SONSHINE SANCTUARY CRISIS ACCOMMODATION & SUPPORT CENTRE is a Christian service, offering safe crisis accommodation to women and children made homeless by domestic violence and its’ associated issues. The Refuge is staffed by volunteers, with the exception of our Team Leader/s. We would like to be in a position to have staff on duty 24 hours a day, 7 days a week. Therefore there are a large number of volunteer staff needed to meet the continuous operation of the Refuge, and new staff are always welcome to join our team. The Team Leader and the Administrator have the responsibility of the overall day-to-day running of the Refuge, taking charge of the support given to clients and organising the volunteer staff roster. They in turn report to the Management Committee. A SENSE OF OWNERSHIP OF THE REFUGE AND INVOLVEMENT IN A TEAM. To assist the Team Leader between 9 am to 3 pm [or part time most welcome] usually once per week or once per fortnight. Some day helpers like a high level of interaction in the case management of our clients. Others choose a specific task of which they take charge [eg Pantry stocks, linen maintenance, gardening, etc] and others help with the day’s routine chores such as shopping, amusing the children, or role modelling such as sharing their favourite easy recipe with the clients. When a client leaves the Refuge, the Day Helpers assist with her departure and help with the bedmaking, laundry & cleaning of the Unit after she has left. Work from 4.30pm to 9 am, usually once a fortnight or month. Their job is to interact with the women as necessary in a caring way, perhaps admitting new clients who are referred during the night, offering empathy to a client in distress, and being aware of safety issues. Interaction with the children, particularly whilst dinner is being prepared, is often most welcomed by the mothers under stress. Modern and clean staff quarters with comfortable bedroom are available for sleep-over staff. [Saturday or Sunday, 9 am – 3 pm approx] Interact with the women as necessary, admit new clients if referred, making sure they are comfortable and have sufficient food/clothing, perhaps arrange a picnic at the local part, or a shopping expedition, role model for the mothers in relation to the children. The roster is usually once per month, or more often if desired, and if a client leaves the Week-end Day Worker helps with her departure, including the bedmaking, laundry and cleaning of the Unit after she has left. Sessional [i.e, when required] from 3 pm – 6 pm weekdays or 9 am – noon on week ends, to focus on the needs of children in crisis. Ideal volunteer position for teachers or child workers, or very experienced grandmothers. NOTE 1: ALL SUPPORT STAFF must hold or be prepared to obtain a Children’s Check Blue Card from the Queensland Commission for Children & Young People. 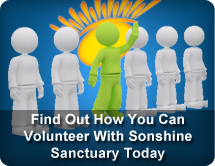 Sonshine Sanctuary can assist with the procurement of same. NOTE 2: ALL SUPPORT STAFF must hold a current Queensland Drivers Licence and be prepared to drive the Refuge vehicle. Be able to show empathy and a caring attitude towards the women and children, as part of a healing and empowerment team offering the opportunities of new beginnings in a safe environment. Be willing to deal with women from many different ethnic, religious and socio-economic backgrounds; support staff will need to demonstrate a tolerance and an acceptance of these differences in a non-judgemental manner. Be committed to helping women and children in crisis and distress. Be reliable in their work commitment, communicating with the Team Leader or Administrator any problems they have. Be willing to participate in staff meetings where possible, approx each 8 weeks. At these meetings, decisions affecting staff are made, and some training occurs. Be willing to take advantage of learning opportunities, including outside training. * NOTE 3: Night Support Staff, Weekend Support Staff and Child Support Workers will need at least a 6-session induction period as a Weekday Worker under the supervision of the Team Leader, before taking up these shifts. The total annual cost of domestic violence to the Australian economy for 2002-2003 was $8.1 billion.